First introduced as a small solo mode for the free collectible card game (CCG) Gwent, Thronebreaker: The Witcher Tales has recently been promoted to a fully priced game. A wise choice considering that, from Etherlords to Slay the Spire, single player CCG have always been quite popular among players. But it also forces CDProjekt to face a haunting question: can the Witcher universe survive without the Witcher? And that's a difficult question. On the one hand, the studio has proved its ability to craft original sidequests and great dialogues paying justice to the charismatic characters created by Andrzej Sapkowski. On the other hand, the main story of The Witcher 3 was quite basic and devoid of any profound themes. And the same can be said about Thronebreaker. 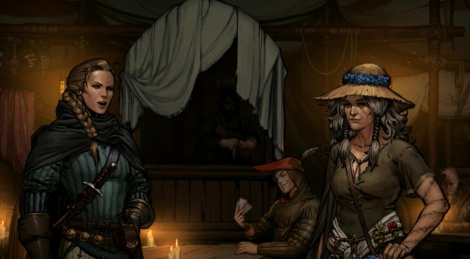 In Thronebreaker, you play as Meve, rightful queen of Lyria and Rivia, as she tries to free her lands from the Nilfgaardian invader. As you can guess, this is going to be a long and painful quest. Well-written and nicely voiced dialogues make the characters likable, which is a pretty good start. The torn society puts Meve in difficult situations were she has to make tough choices, sometimes with tough consequences. So yes, the world is immersive, but in the end, the story remains once again very basic and forgettable. Maybe because the queen lacks the charm and insight of Geralt. Exploration is also on the light side. You roam through 5 vast regions rendered in a nice looking comics style. In between battles, you'll mostly do three things: listen to the chichats of the inhabitants, dig some hidden treasures and pick up LOADS of gold and wood. The resources are used to unlock new perks and improve your army - in other words, getting new cards. It's fun but it could have been developed more, like in Heroes of Might and Might. It's not that big a deal though, because there is Gwent. Who got the biggest one? If you're unfamiliar with the game of Gwent, you need to know it's an unusual CCG, very different from Magic The Gathering's lineage. During the fight, there is no resource management at all, you just play one single card (strong or weak) per turn. You need to win two rounds (so you can pass on one) and you only draw new cards at the beginning of a round (so you need to manage your hand). Most importantly, victory does not come from killing your opponent but from having the most powerful army on the battlefield. Of course, you can destroy your opponent's creatures to achieve that, but that's only one option among many others. You can use combos to boost your units, exploit the strength of your enemies, use the creatures that remain at the end of a round, play cards allowing to call back a soldier in your hand, to raise the dead from their graveyard, to call for reinforcements, or also use cards with afterdeath effects, cards that move units across the lines of the battlefield… Gwent's depth is just impressive, every single – and by the way absolutely gorgeous – card has a special ability. Furthermore, for some reason (pace, generous mulligan), deck building is way more important here than in other CCG. Battles are more about planned strategies than reactive tactics. Even better, Thronebreaker's main campaign does not just rely on classic fights. It also introduces some challenges that you must pass with your own deck and clever puzzles that must be solved with provided decks. How can true CCG fan resist that? Despite neat production value and dedicated writing, Thronebreaker might slightly disappoint those coming in for a memorable epic tale in Geralt’s world. That being said, single player CCG lovers and players willing to rediscover a much evolved Gwent will have a really good time. Thronebreaker is both a comprehensive fully fledged adventure and an in-depth introduction to the multiplayer matches. A great achievement in its own right. I'm glad CDPR didn't go Ubisoft and EA way and release their games only on their own secluded platform. Because there were talks they'd only release Thronebreaker on GOG. You didn't read the books, did you? It really adds impact on the Witcher games as well as on Thronebreaker.